Gesha 19 (Gesha) is a 16.1HH 15 year old chestnut mare. She is a Hanoverian showing in low child/adult jumper divisions. 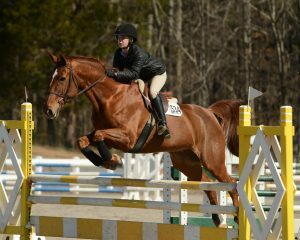 Gesha has been the annual champion and reserve champion in low and high child show jumper divisions in Middle Tennessee Hunter Jumper Association. Gesha is an easy keeper, always sound, competes with a lot of heart and loves to win. For show record, view USEF #5231224 and MTHJA #2168. If you didn't find the information you're looking for or would like to talk to a real person please give us a call. We'd love to chat with you and answer any questions you have.